That quote is one of the most humbling ones that is true in the simpliest terms. So, the reason for bringing up these two quotes brings us to what this post is about... 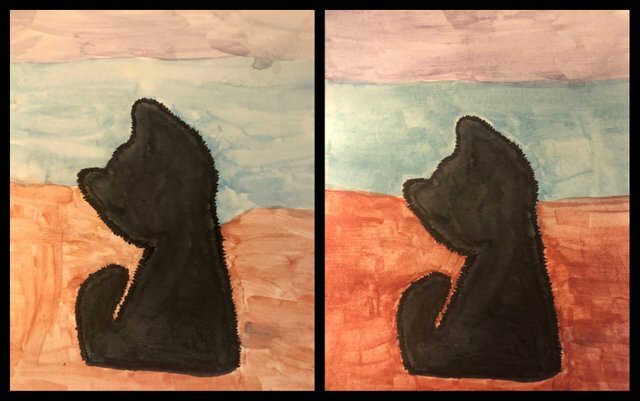 This piece of artwork I created of a black cat... The first image was my original but then I decided to keep working on it and darkening up the colors some. I took pictures of both outcomes. I'd like some feed back on both of them. In my opinion the second is my favorite. Hopefully in the near future I'll have a updated rendition of this drawing/painting. Enjoy! Yes, everyone has to start somewhere, so there's no shame in learning a new skill. Keep learning and practicing and you'll get better. Although I think you're already doing really well. I like the second picture better as well. I think it looks more "finished" than the first one. I also like the brighter colors, specifically the reds.